The folks at Cover are looking to change the way consumers pay for their meals at restaurants with their Cover iPhone app. 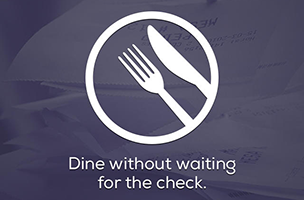 The app is supported at over 80 restaurants throughout the New York City / Brooklyn area, and allows users to pay for their meals via information stored within the app, without waiting for a bill. Since launch last Summer, the mobile payment app has grown to process $100,000 each month. When dining at a participating restaurant, Cover users are asked to notify their server they’re “paying with Cover,” and the restaurant and app handle the rest. Users can customize their tip percentage before dining, and can add new credit cards to the app for multiple payment options. While Cover works in large groups, consumers can also split the bill, using Cover to only pay for a portion of the total cost. The app’s account screen offers users a view of their promotional credits (where applicable), and the app itself will send out notifications when users are near a restaurant in the system. Cover is available to download for free on iOS and Android, with a full list of supported restaurants available on the company’s website. The team is working on adding additional restaurants to the platform, and interested restaurant owners can learn more on Cover’s website. Check back soon to follow Cover on AppData, our tracking platform for mobile and social apps and developers.